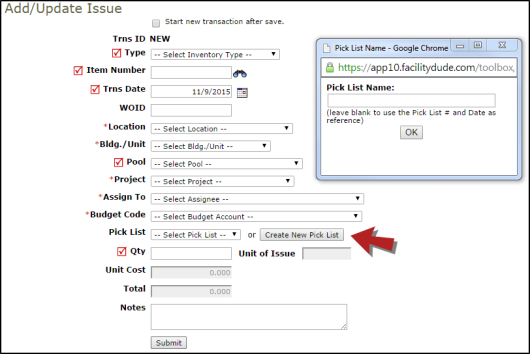 When you issue inventory, you have the option to assign that issue to a pick list. A pick list allows you to print out a group of issued inventory so they can be retrieved from a warehouse. Think of it as a “Grocery List” of items that need to be collected and delivered. Pick lists can be created independently or from within the transaction screens as you are processing issues. Whether you are processing a New Request or adding a new Issue, you will have the option to create a new Pick List and assign the issued items to it. Click on the Pick List link under the Transactions section of the Inventory home page. This will bring you to a list of the existing pick lists in the account. Click on the New Pick List link in the Shortcuts section at the top of the page. Enter a Pick List Name and click Submit. This Pick List will now be an available selection as you are processing your issues. On the Process New Requests page, you can select an existing Pick List from the drop down list or you can click on the Create New Pick List button. Enter the Pick List Name in the pop-up box and click OK. *Note: If you leave the name blank, the system will assign one using the number of the pick list and today's date (Example: 108 - 4/9/2015). Select the appropriate pick list, process the request, and click Submit to save. If you are entering issues that have not come from a request in the system, click on the Issue tab at the top of the screen. Click on the New Issue link in the Shortcuts section. Enter the information for the items you are issuing. Next to Pick List, select an existing Pick List from the drop down list or you can create a new one by clicking on the Create New Pick List button. Click Submit at the bottom of the screen to issue the items and add them to the selected pick list. This will bring you to a list of the existing pick lists in the account where you can see the date it was created, the number of requests/issues assigned to it, and the date it was last printed. *Note: Any pick list that does not have issues assigned to it can be deleted from the list by clicking the red x on the right side of the list. Click on the printer icon beside the number of the pick list you wish to print. In the pop-up box, select if you would like to sort the pick list by Aisle/Bin or Item Number, and then click Print Pick List. You will see a print preview of your pick list that you can then send to your printer. The Pick List Delivery Receipt sorts the issued items by their Delivery location and will print each location on a separate page. It also includes signature and date lines at the bottom of each page for the receiver to sign and confirm delivery. Click the Print Pick List Delivery Receipt link in the Shortcuts section at the top of the page. In Steps 2 through 11 make selections to narrow down the report by Location, Inventory Type, Pick List, etc. *Note: If you need to print a delivery ticket for one specific pick list, you can simply select the date in Step 1 and the pick list name in Step 7. Select PDF as the Report Format. You will see a print preview of the Delivery Receipt that you can then send to your printer.